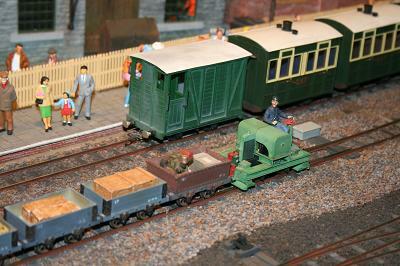 It is next summer and the Ashcross Industrial Museum has just opened for its first season. 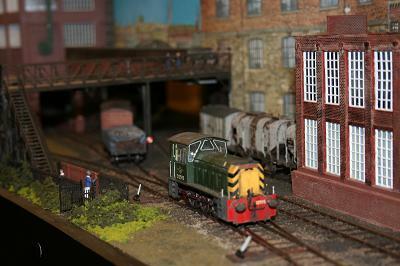 The museum is based in the Victorian engineering works of Joshua Berson in the Midlands town of Ashcross. All of this is fiction, there is no Ashcross, but I wanted to do something different and I chose modern day preservation as a theme. Setting it in the museum also provided the excuse to run a variety of old-fashioned rolling stock. The Dyserth branch from Prestatyn remained open until 1973 serving the locality with agricultural products, household coal and stone. No run round facilities were ever provided - the train was pushed the three miles from Prestatyn with the guard acting as lookout. Motive power in the 1970s was predominantly class 24 and class 25 diesels. A 15 mph limit was imposed on the branch. All the salient points of Dyserth have been incorporated into the model, but have been amended to fit the size of the baseboard. All stock used on the layout is fully detailed and weathered. 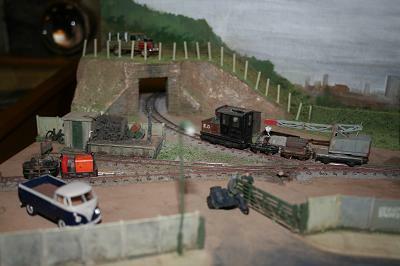 The layout was built for the 2002 DEMU small layout competition which among other things, stipulated that it mustn't exceed an area of 654 sq ins and have at least one working point. The track plan was arrived at using points that we already had in stock and a traverser, to save space and allow hidden sidings plus connection to the run round and grain uploading shed. We chose to model a brewery as we like beer! Such a prototype would also allow industrial buildings and a variety of wagon types. The wagons that can be seen are opens, vans, coal, grain and the odd internal user. The buildings are from the Walthers meat packing warehouse kit, from which we got the main building (with loading dock) and grain unloading building. The baseboard is built as a single unit with legs that plug into pockets underneath. 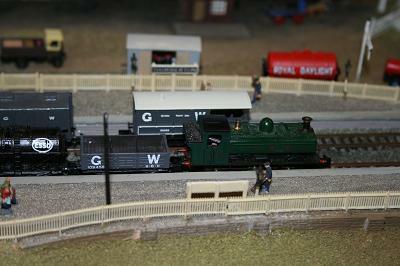 The layout gives a chance to show a varied display of shunters and wagon types, some which are scratch-built. We wanted to build a layout that would be of use beyond the competition and be interesting to operate too, as such it has exceeded the original design brief. 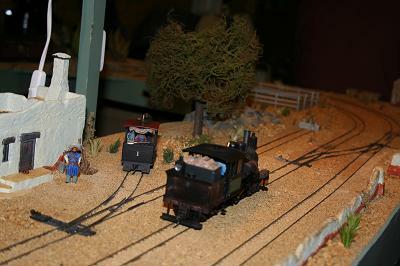 What else do you call a model railroad layout influenced by Spaghetti Westerns, Clint Eastwood and Sister Sarah? The layout has no historical base and we are not quite sure which State/Country it’s supposed to be set in either - Texas, Mexico or Spain, but there again who really cares? The layout is of standard timber and plywood construction, easy enough to transport but resilient enough to withstand the rigours of exhibiting. The track used is the run-of-the-mill Peco code 100 Set Track buried up to the rail heads in graded sand ballast. Additional scenic details include Anita Décor’s “cacti” and other unusual desert plants, as well as two real cacti. The majority of locomotives, passenger and freight cars are from the Bachmann 0n30 range, most either heavily weathered or kit-bashed. Some of the freight stock has been re-wheeled and also fitted with scale Kadee couplings. 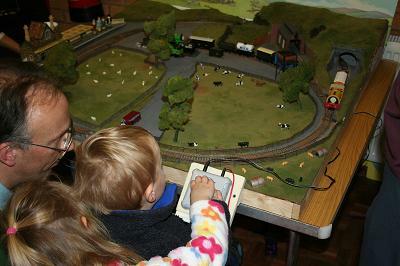 The electrics are the usual 12 volt DC as we like to keep this aspect of the layout as simple as possible. 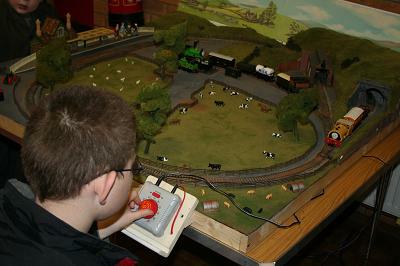 The switches (points) are all manually operated. 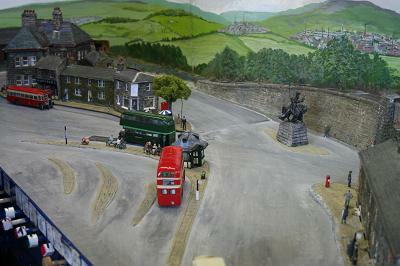 The most unusual feature of the layout is the buildings and figures. The buildings are all resin castings produced for the wargaming market with the figures being produced for the same. The first Mark layout was in existence for some twenty years and was showing its age, so it was decided that the time was right to build Mark II. The track plan is similar, with the addition of a siding for loco coal and water. 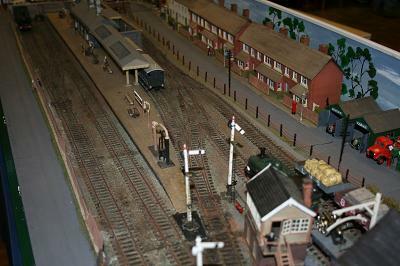 The station area uses most of the buildings off the original layout and these are nearly all concrete structures, as are the platform, fencing and lamp posts. 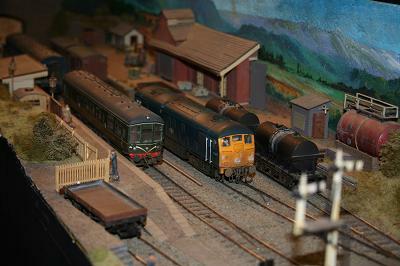 The period is set in the fifties and the locos and rolling stock are a rather motley collection. There is a steam engine for passenger trains, a diesel for freight and ED the engineering department engine. 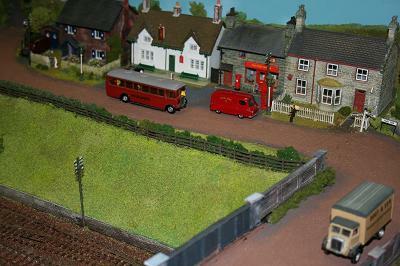 The layout depicts a small station and nearby factory and sidings on a Western Region branch line in the late 1970s or early 1980s. 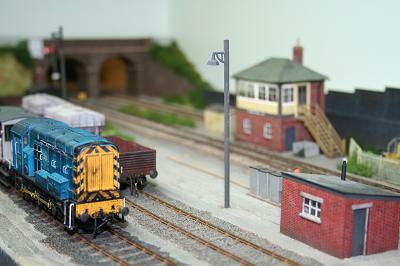 Blue diesels and vacuum fitted and unfitted freight trains are operated. The passenger service is usually provided by a diesel multiple unit. The layout is designed to be multipurpose. It has a minimum size of 9’ x 2’-6" plus a fiddle yard which depicts a terminus made possible by the closure of the through line. 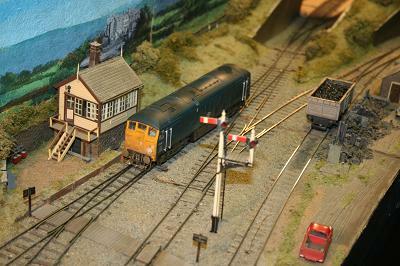 However, the through line can be restored by the addition of two further scenic sections and the use of the fiddle yard from our Knowle Bridge layout. The layout can be displayed from either side, enabling the layout to have a different perspective each show. The idea was to be able to run locomotives at home without taking up too much room but to have a decent size layout for exhibitions. 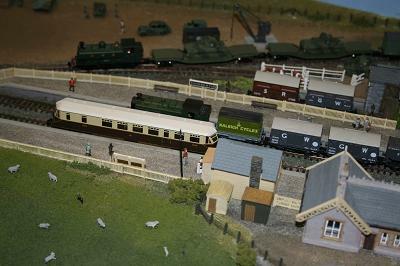 The layout itself is based on Great Western practice during the 1950’s thus enabling locomotives from other regions to be found stabled in the engine shed. It also gives flexibility for locomotives with pre BR numbering to be seen depending on which end of the 50’s is run. The track is SMC with Peco code 75 points. 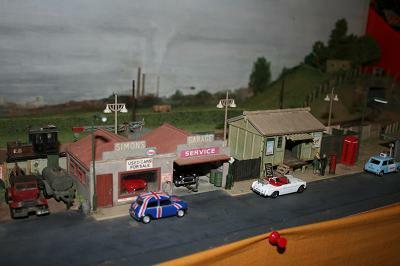 Generally the railway and buildings are scratch-built using bits from various kits and the cooling tower is the Ratio kit. Domestic properties and shops are from the Skaledale range suitably modified. Signals are Ratio and MSE kits. There is a working turntable built into the yard, again scratch-built to GWR design, which was given to me by a lady whose husband had sadly passed on. Locomotives and rolling stock are usually ready-to-run items with fine detail added and the odd one or two kit built ones. 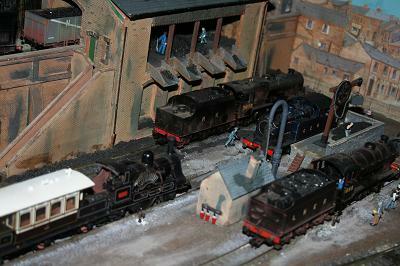 When the layout is at its maximum, the locomotives and coaching stock are supplemented by the excellent kit built stock from the Rob Newman stable. The North Eastern Railway, N.E.R. opened its engine shed at Ferryhill, County Durham in 1881 to house a dozen or so goods engines, the allocation had risen to about twenty by the time of the Grouping in 1923. Two class G5 0-4-4 tank engines were added but numbers remained fairly consistent until 1935. At this point Ferryhill was given the allocation of motive power displaced by the closure of Shildon shed, however it only survived for two more years before closure. Ferryhill enjoyed a brief claim to fame during World War Two, when exhibits from the National Railway Museum at York were sent for safe keeping. 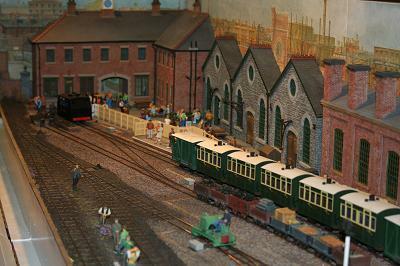 For my modelling purposes there was, of course, a second, but completely fictitious, locomotive shed at Ferryhill, called Plank Lane. This shed was built on a site originally occupied by the York, Newcastle and Berwick Railway which was taken over by the N.E.R in 1854. The depot being retained and enlarged to house freight locomotives used to service the coalfields of County Durham and North Yorkshire. Unlike its counterpart, Plank Lane survived much longer, mainly due to its location in the triangle formed by the lines to Stockton and Darlington that gave better access to diverging routes. 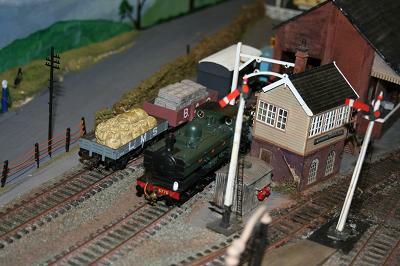 When the locomotives allocation increased at Plank Lane, it was decided to provide a turntable. Land was acquired in 1937 and by late 1938 a 70 foot vacuum tractor turntable had been installed. Plank Lanes reasonable proximity with Darlington works, to the south meant that it could also be used by locomotives on running in turns after attention at the works, therefore allowing a variety of motive power to be seen visiting the depot for checking and servicing before returning to the works. 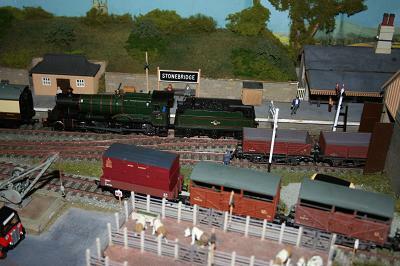 The scene you see is set around 1946 when the LNER was embarking on a renumbering scheme. Some locomotives can be seen newly re-numbered while others awaited such attention. 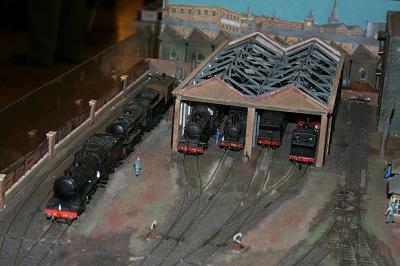 The shed roof was damaged by fire and has been removed awaiting replacement, while other parts of the depot have recovered a little from wartime austerity. The fictitious sleepy town of Rossmore is set in the West Country. The period is the 1930s just before the war. It is mainly a farming area with some light industry. The track is Peco Streamline fine scale. 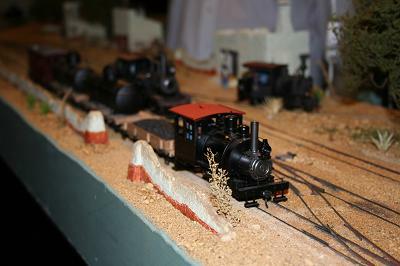 The rolling stock is a mixture of kit built or detailed ready-to-run. 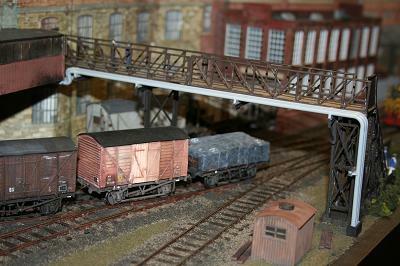 The houses and the goods shed are all scratch-built from cardboard and Plasticard. The station is a Ratio kit. The stock is a mixture of kit built and detailed ready-to-run. Thorberton is based on the station and track plan at Thorverton on the old Exe Valley line as it was in 1930 to 1950. The locomotives are Farish and Dapol, the rolling stock Farish, Dapol, Peco and scratch-built. The buildings are all scratch-built. The track is all Peco code 55. Points are worked by the wire-in-tube method, decoupling is done by electro magnets under the track. 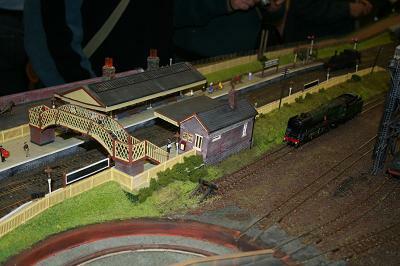 The two ends of the layout are a bit of Modellers' licence. 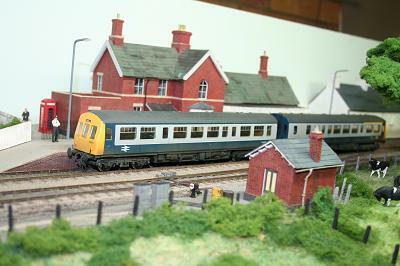 All the trains you see may not have been seen on the Exe Valley line, sorry but it is my layout!